SALON LE POSH announces exclusive deals on spa treatment packages for Los Angeles locals this holiday season up to 15% off. "We are excited to offer special treatment packages so people can relax and enjoy their holidays!" SALON LE POSH announces exclusive deals on spa treatment packages for Los Angeles locals this holiday season. Special spa packages starting December 1 through December 31,2012, offer 15% off of the Le Posh Vichy Package and Le Posh Hot Stone Package. The Le Posh Vichy Package includes a 30-minute body scrub, 30-minute massage, Le Posh mani + pedi, and blowout for just $199 (valued at $235, gratuity not included). For individuals due for a stress and tension-relieving massage, the Le Posh Hot Stone Package: 60-minute hot stone massage, pedicure and blowout - $170, (regularly $200, gratuity not included) is recommended. Located at the hub of Hollywood, Salon Le Posh serves as a beautiful and decadent getaway to busy Angelenos. As a one-stop-shop beauty treatment center, Le Posh isn't your average full-service salon and spa. Salon Le Posh offers all the high-end services of a hotel spa or destination resort with the warmth and personal touch of a boutique destination. Clients can enjoy the luxury of being pampered with unique spa treatments and full hair services, while enjoying a cup of cappuccino or glass of champagne for VIP's. Le Posh transforms the tedious task of beauty touch-ups into a fully integrated pampered escape. And, with the convenience of being located on Sunset Boulevard, clients have the luxury of getting pampered while soaking up the Hollywood scene. The modern design of Le Posh's space immediately transports you to an ethereal, serene utopia from the moment you walk through the door. Each part of Le Posh incorporates the most innovative technology with tranquil aesthetics. Just getting your hair shampooed is an indulgent experience – a ceiling-mounted plasma screen plays the latest runway fashion shows while specially crafted chairs work out tension-plagued muscles at the shampoo bar. 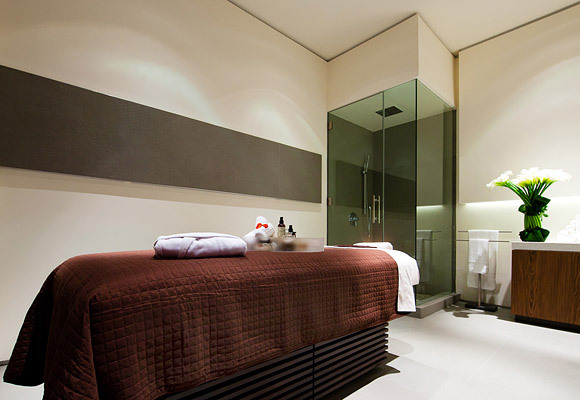 Salon Le Posh also uniquely offers a Vichy (or “wet”) room with 14 shower heads (most Vichy rooms have a standard 4-6 shower head set up) for the ultimate exfoliation and hydrotherapy massage experience. Le Posh's carefully selected team of specialists have years of training and experience, as well as regular training courses to continually grow their range of expertise. From cuts to color, to the latest hairstyles and trends, Le Posh's expert hair designers make it their mission to make you look and feel your best. 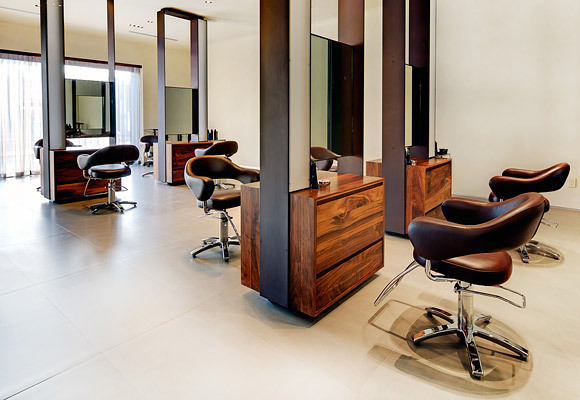 All hair treatments include Oribe hair products as part of Le Posh's standard service. And of course Le Posh offers much more than salon services! Spa manis and pedis, relaxing massages, and customized facials are just a fraction of the specialty spa treatments offered at Le Posh. Famed skincare brand, Biologique Recherche, is solely used for all spa treatments. Combining an expansive space with modern décor, muted tones and a welcoming team will make you feel at ease and indulgent from the moment you walk in. 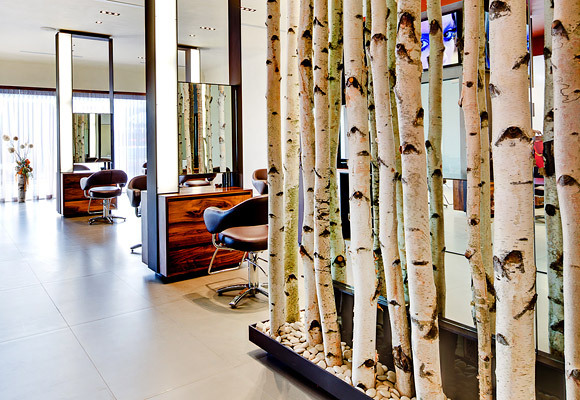 Salon Le Posh offers the highest quality services, products, technology and specialists with an ambiance and elegance that far exceeds any expectation. 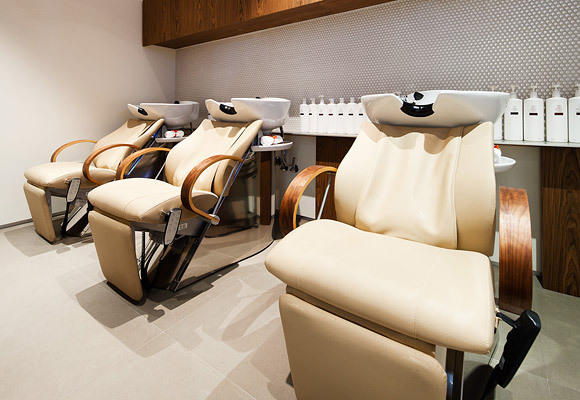 Acting as a lounge, salon, and spa center, Le Posh stays true to it's name and sets the standard for full service salons - offering guests the white glove treatment without the stuffiness normally associated with high end spas. Since opening in 2010, the salon has had one mission in mind: to provide an unparalleled level of excellence in every service they offer. By allowing Salon Le Posh to focus on one area of service and working symbiotically to complete their customer experience, clients can be confident that they are receiving personal treatment with results that are as individual as they are.